Could you tell us who are the Vambo Community Activists? The Vambo Township Development Association is made up of ordinary people living in the isolated and long ignored and underdeveloped Vambo Township in District Number Two, Grand Bassa County. They are joined by a network of extended family members who live in Monrovia, the capital city of Liberia, and spokespersons in the U.S. include Matthew and Isaac Gblorso; Moniyue Brown and Mamie Boe, prominent women community leaders, Zach N. Davis and lastly Kona Khasu, Sr., a former Deputy Minister of Education during the first term of Liberia’s first woman President, Ellen Johnson Sirleaf, and Liberia’s prominent 1970s playwright when he was Director of the National Cultural Troupe. Members of Mahlor Township, our nearest neighbors, have also joined us. David Kennedy Vanyan, a son of Mahlor Township, is a powerful speaker for the shared interests, history and familial inter-relatedness of both townships. How is the experience of mining in Liberia: have there been many projects in the past, is mining a common struggle for local communities? Could you explain what type of mining activities are taking place in Vambo Town? Is it gold mining? Diamonds? Other minerals? Presently, it is only gold mining, however, it has been speculated that there are other minerals. The gold mining is done by groups of itinerate miners, mostly youths, who engage in what is now being called ‘artisanal’ mining – a term far too elegant for what has occurred on our land. The miners – or ‘gold boys’ – as they are called hail from Liberia as well as West African countries, such as Guinea, Sierra Leone, Mali, Ghana and others. They use manual labour with basic hand tools such as shovels and diggers mostly. Since when are these activities taking place? And how many communities are being impacted? There has been very small-scale gold mining in the mountains above Vambo and Mahlor Townships since the 1960s and perhaps before. But the discovery of gold deposit in November 2014 attracted national and even international attention. Twenty communities out of the 48 communities in the Vambo Township have been adversely affected by an unprecedented influx of over fifteen thousand gold seekers from all over. They outnumbered and overwhelmed the local population by far. Gold seekers from abroad and other parts of the country have introduced wide varieties of criminal activities including stealing food crops on which the local subsistence farmers solely depend, pillaging livestock, looting communal assets including the only two hand pumps existent in the Township. Countless miners have been murdered by other miners for their “fortunes” before they could leave the pits to meet buyers or their sponsors. Fortunately, no local inhabitant has been killed in this manner. However, we live in fear of being victimized and under constant threat. We cannot attend their normal farming activities for fear of being attacked or due to destruction of farmlands and the river and creeks depended on for water. Do you know if a company (or companies) is involved? Is it a Liberian company or is it from abroad? In the beginning, the miners were largely Liberians. Soon illegal aliens from Sierra Leone, Guinea, and Ivory Coast to as far as Mali and Burkina Faso, Ghana and Nigeria joined them. At the peak of the mining frenzy before the rains, several foreigners from Europe, Asia, the Middle East and even some ‘big hands’ – prominent Liberian citizens – were rumored to be secretly financing miners and pits. Some foreign timber concession holders and their local partners made proposals for claims as well. So there was no single company as it were but the net effect of all these competing interests was as overwhelming and damaging. And there was no one company of individual to hold accountable. What are the problems that the communities in Vambo town are facing in relation to this mining? Are there environmental problems such as deforestation or water pollution? Are there health risks involved for the local populations? The forest is being cleared indiscriminately to get to the gold deposits. A portion of the Findley Mountain has been reduced to pits and tunnels for mining the gold. The soil has been destabilized, and any sustained rains could cost mudslide unto the “residential” section of the No Way Town, the town at the base of the mountain. 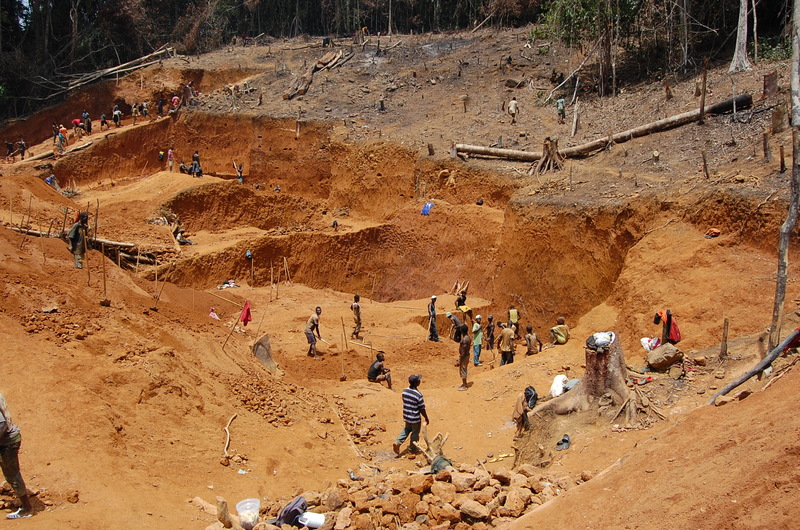 At the peak of the mining in early 2015 there were reportedly 20,000 illicit artisanal miners. Large trees, hundreds of years old were cut down and burned to clear space for mining pits. Miners operate 24-hour shifts with some sleeping during the day in order to mine at night using artificial light sources. Locals are afraid to farm for fear of rogue miners stealing their crops. Gangs are pillaging farms and taking the crops to the market in No Way Town. It is reported that some of the law enforcement personnel begun to mine themselves or to have miners working for them. The creeks and rivers serving the township have become muddy and unsafe as miners use the creeks and rivers to pan for gold as well as to wash their bodies. Many have taken to using the waters for relieving their bodily functions. The stealing of the two communal hand pumps have left townspeople with no choice but to use the rivers and creeks for washing, drinking and cooking. Under these conditions, any outbreak of disease will spread rapidly, especially since the population is not fully aware of the short and long term dangers of drinking polluted and diseased water. The township is under constant threat of cholera and other water-born diseases. Miraculously, the township was spared from the recent Ebola epidemic. There are no clinics or health posts so ill persons, expectant mothers and the elderly have to be carried on human back or motorcycle – if they are well enough to sit up – to the nearest health facilities in Buchanan, 25 or so miles away. On several occasions we have had to pay transport for sick persons. Was there any consultation with the affected communities before or during the mining activities? If so, who organized the consultation (the company, an NGO or the government?) and how would you describe the consultations? No, there were no proper consultations to speak off. The meetings were largely for show as employees of the Ministry of Land, Mines and Energy ignored the tenants of recent laws Community Rights Laws from 2006 and 2009 and set about parcelling out large portion of township land as mining claims. They also failed to seek inspections of other relevant government agencies that by law should have been involved. Those would include the Forestry Development Authority, The Environmental Protection Agency and the Ministries of Health and Labor, respectively. These oversights happened as certain individuals from the community and representatives of the government put personal interests above the community at large and the laws of our country. This is common practice in Liberia. What activities have been/are organized in the communities to resist the mining activities or company? A series of largely cosmetic community-based meetings, public dialogues, and meetings with local and central government offices were initially carried out with the usual lip service being paid – promises of road building, etc. The past few months have seen positive developments as some local officials are now paying some attention to our situation. These responses came after our letter-writing campaign and video clips of the destruction and degradation were hand delivered to elected and appointed officials and eminent citizens and friends of Grand Bassa County. Since then, we have seen a level of response from some members of the Grand Bassa County Legislative Causes, the County Superintendent, and officials of the Ministry of Land, Mines & Energy. What are the demands from the communities in relation to the mining activities? (1) Stop the expansion of the unregulated mining activities responsible for the level of destruction and environmental degradation of our communities; (2) Prevent increase of such practices, (3) Remedy damages already done (4) Insist that government support the communities in acquiring safe drinking water, schools, clinics, and skills training/employment opportunities for the youth and (5) to continue to take control of our natural resources and to decide when, how and with whom we engage to harvest these resources for the greater good of the community, Liberia and business “partners”. Do you have any idea on who is buying the gold and to which international companies and markets it is being traded? We are not sure who buys the gold but it is likely that it ends up among the handful of powerful Monrovia-based brokers for international markets. Our focus has been to bring the situation unfolding in our community under control by engaging the proper authorities through the law and not necessarily identifying the “big hands” behind things. What has been the government’s reaction to the communities’ demands? Do you feel that the demands are being heard? Initially, the government deployed troops of special riot police forces – the Emergency Response Unit (ERU) and Police Support (PSU) of the Liberia National Police – to stop the killings and other forms of crimes and lawlessness. Fifty police officers were permanently stationed in the mining camp for five months. It is common knowledge that these officers began to mine themselves which led to a riot between disgruntled miners and the officers. Persons lost their lives during this fracas. The Government sent officials from the Ministry of Land, Mines and Energy on several occasions to assess the situation. This ministry also established a sub-office in the No Way Gold Camp. Revenue agents were sent to collect government taxes from the mining. Besides, the Ministry of Public Works engineers conducted an assessment of the 12-km motor road from the BIA Market to the No Way Gold Camp. Road construction began in February 2015. Barely two miles were graded when the work was halted at the first large creek. Immigration failed to make any real attempt to address the presence of thousands of foreigners plundering the mountain. While, they have been more responsive since our letters and accompanying video was sent to our Representatives and Senators it is fair to say government did not fully respond to our demands. It is also fair to say government may have been overwhelmed by the situation for several reasons we will not get into here. Yet and still our community suffered greatly due to what occurred and is struggling to pull itself together. Which kind of international solidarity do you think would help to support the affected communities? 2. Raise funds for improving our livelihoods and supporting community projects, i.e., agriculture, income generation activities, education, health, and trainings in leadership and advocacy. 3. Ensure that mining of gold and other mineral resources should be done accordingly to best practices and policies of Natural Resource Governance and Management as well as existing Community Rights Laws of Liberia. 4. Ensure community involvement in negotiations of all natural resource agreements (both mineral and forest resources), with the right to say “No” to any of the proposed forestry or mining activities if it is not in the interest of the community and the nation at large. 5. For the communities and people of Vambo Township, to get fair financial benefits and tangible infrastructural development due to the extraction of minerals and forest resources on our land. * WRM addition: Mining in Liberia has always followed the interests of foreign companies and business. The Liberian-American-Swedish Minerals Company (LAMACO), now a defunct corporation, was founded in 1955 by American and Swedish investors. The company established the first large-scale mining operation in Liberia, today being reactivated by the multinational Arcelor Mittal, which is partially rebuilding the Lamaco railway for shipping the extracted minerals. Likewise, the BONG mining Company, a German-Italian concession established in 1958, constructed one of Liberia’s main rail lines to ship the iron ore from the mountains, leading to the displacement of local populations and environmental harms.